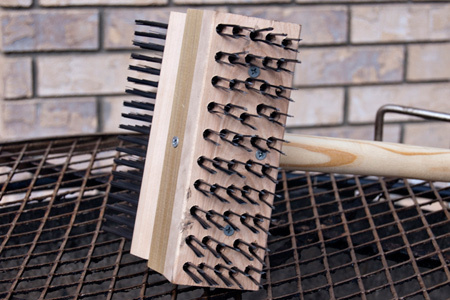 Just about anyone who has used a grill more than once knows how important a grill brush is. A good brush is a must, and there is plenty of junk out there. Here I'll review the seriously turbo magnum Texas Brush. We all know the familiar cliche that everything is big in Texas. Well, in the case of this brush that statement is no joke! Check out the dimensions of this thing! In addition to its sheer size this beast has seriously aggressive carbon steel bristles. One side is fairly normal, but the other looks like it could be used to clean the treads of an M1 Abrams tank! As soon as you take the brush out of the box it's obvious that it is well-made with quality materials. It weighs nearly five pounds and the wood is clean and free of knots or other defects. You can see in the pictures that this isn't a high-tech piece of equipment. 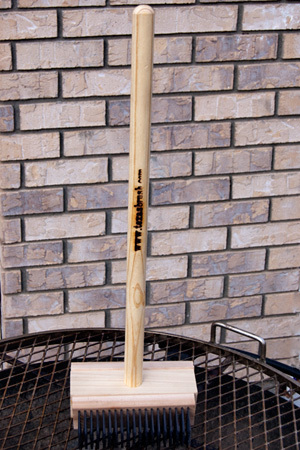 It's simply a 24" handle attached to a wooden wedge with a brush screwed into each side. They also offer a four-foot wooden handle, a metal handle, and two other varieties of brush head (stainless steel and brass). You can build your own at their site. 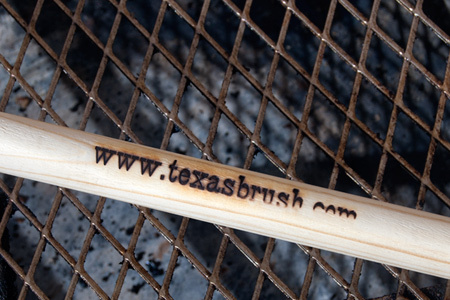 The Texas Brush works well, depending on your grill. 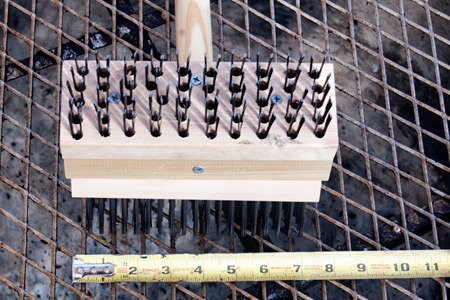 The long handle, size and weight are good for large heavy grills. However, I think it's much too large and stiff for smaller grills, like a 22" Weber kettle. The effort required to get good cleaning will likely push the grill over. This is especially true on expanded metal grates like you see in the pictures here. The grill in the photos is 32" in diameter and weighs 80 pounds, and I was moving it on my driveway with the brush. Perhaps the brass bristle head wouldn't take as much effort. The coarse teeth do a great job of getting the gunk from between the wires on a standard grate. Another drawback is the price. As I mentioned earlier it is well-made, but I don't know that I could justify the $49 for the "Texas Jr." model that you see here. 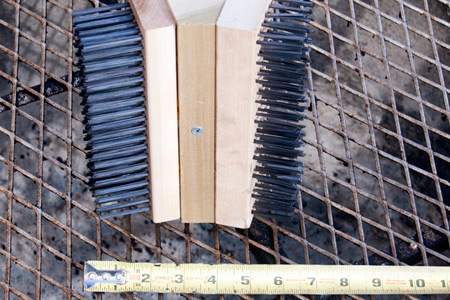 You can pick up a standard broiler brush from the internet or a restaurant supply store for half the price or less. Perhaps the Texas Brush is superior in the long run, I don't know. The bottom line for me is that this is a good choice if need to do serious heavy-duty cleaning on a larger heavy grill (or commercial broiler), and you don't mind spending the extra money. Disclaimer: The brush was provided to me free of charge for the purpose of this review, but the thoughts expressed are entirely my own. Safety Disclaimer: I would NOT recommend this for 80's big Texas hair! LT - No, the app isn't mine, and I don't recall licensing my recipes for an app. What's the name of the app? If u go into the google play or market. Search for bbq recipes. Its free. I did some digging for you. Tjey use a database that pulls recipes from feedburner/patiodaddio.com or something simular. It pulls from your rss feeds and three sites that i know of. It reminds me of a honey pot but with recipes instead of pirated software. Haha. I hope thos helps you out. I know they cant steal your recipes but i would think there would be a fair use policy in order to even pull the rss feed. Shoulsnt they at least ask u first. Thanks. Just watchin out for my friends. I did search for that and I found a bunch of apps. Do you know the name of your specific app? I appreciate you being on the lookout. Thanks. Yeah its actual name is Barbeque Recipes by MINTMEDIA. That is all the app and droid market is giving me. When i first opened tje app, i read an article it brought up and the writing style sooo reminded me of yours. Thats when i hit the continue reading link and it took me to your site. Thats when i became curious and felt i should let you know. Originally i thought, since you are a software engineer, that you jumped on the app bandwagon. Anyway thats all the info the droid market will give me. Thanks. I have sent an email to you. hope all is well.